With the goal of winning money for the school’s art program, East Kentwood High School National Art Honor Society Club members recently worked in groups on a shoe design. Freshmen Amber Swanson, Rebecca Olthoff, Isabella Williams and juniors Janelle Urena and Jayda Haynes considered how to express local flavor with style in a piece of footwear, adding elements of the Great Lakes and Michigan industries like cars and furniture into their sketch for the nationwide Van’s Custom Culture art competition. Like many of the club’s projects, their work extends beyond the classroom. 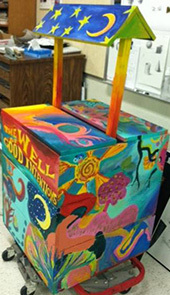 The popular club focuses on community service, competitions, connections to careers and creating a strong art presence at school. About 50 students are involved, meeting after school once a week. Projects have included a huge jungle-themed mural at the Grand Rapids Children’s Museum, murals for Hamilton Early Childhood Center, and a whimsical wooden wishing well for the Kentwood Public Library. For children at the library, students also initiated Reading and Craft Hour, held monthly in June, July and August, and created cards for local nursing home residents. For Jayda, it’s a chance to get involved in art with her friends. “It’s really fun because I don’t have art (class) all year, so being able to do this keeps me included in the art community,” she said. Art teacher, Le Tran, started the club in 2009 as a chapter of the National Art Honor Society. In 1978, the National Art Education Association began the NAHS program to inspire and recognize students who have shown an outstanding ability and interest in art, though it’s open to all students. Advisers, Tran and East Kentwood Freshman Campus art teacher Adrienne DeMilner, said it’s a way to offer an extracurricular art opportunity outside of classes. “Our mission is to make time for ourselves, to make art for personal enjoyment, for the community and for our school,” Tran said. DeMilner said what students learn in the club translates to many different careers, even those that fall outside of art. Senior Eileen Tran, a passionate student-artist, said the club is a great way to be involved in her craft. They travel to downtown Grand Rapids and Chicago to learn about art culture. These trips are new experiences for many students. Students in the club and school-wide art classes also have the opportunity to enter many competitions. Kentwood students recently took home awards in the Michigan Education Association state and Region 9 competitions, and the Scholastic Art and Writing Competition. There are many art offerings at East Kentwood High School, where the art program has produced numerous award-winning and professionalartists. 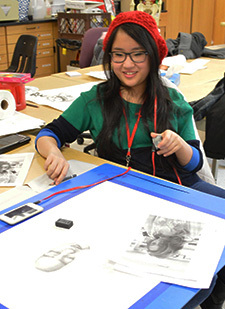 Tran teaches a dual-enrollment Kendall College of Art and Design class, for which students earn three credits. Tran and DeMilner were also on a task force at Grand Rapids Art Museum last summer to create curriculum for educators.